Jaipur, the ‘pink city of India’ is better known for its royalty and the wonderful monuments. But, very few people are aware of the list of endless things that make it a must visit shopping destination. There are undoubtedly some remarkable shopping places in Jaipur which can enrich your total shopping experience ten-fold. If you’re a Shopaholic, then don’t look anywhere else for a shopper’s paradise! The unique beauty and the traditional touch on the things will leave you smitten in no time. You don’t need to wonder about which places to visit in Jaipur for shopping. Jaipur is home to India’s largest and the most fabulous collection of jewelry of all types – precious stones and gems, semi-precious and jewelry with a limited warranty. And Johari Bazaar — one of the earliest Jaipur shopping places where you can buy all these. The plethora of choices and amazing designs will leave you spellbound, especially the wonderful handmade, delicate jewelry. Specialty – Shop for jewelry with precious gemstones and handmade necklaces which are just beautiful and available at reasonable prices at this Jaipur market. Tripolia Bazaar is known for its lac jewelry and the beautiful varieties of bangles is the best shopping area is Jaipur. 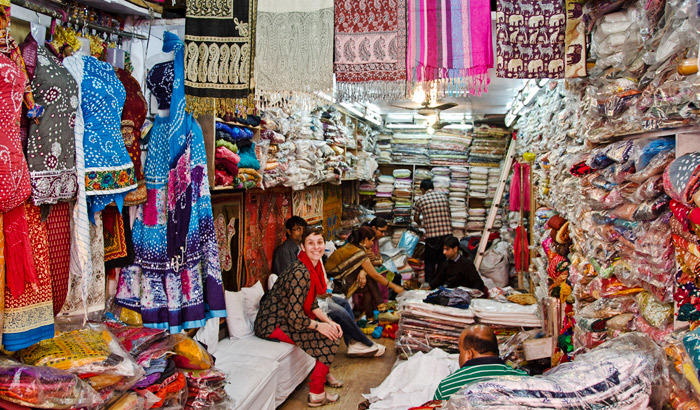 Shop for the textiles in Tripolia Bazaar. Flaunt the popular Bandini tie and dye fabrics with rich embroideries are also available here. Also, you can buy designer carpets, brass ware and other traditional wares. Specialty – Shop for lac jewelry which comes with exquisite designs at this Jaipur shopping place. Chandpol Bazaar, one of the traditional shopping markets in Jaipur, is where the creativity comes alive; where you can come across handicrafts, carvings made out of marble and other hand-looms. At the Khazanewalon ka Rasta, you can shop for popular pieces like the traditional and flamboyant shoes, pretty handicrafts, perfect sculptures made of wood and stones, carpets, turbans or anything that you absolutely love! Specialty – Don’t forget to shop for marble sculptures which come in all hues and designs and relish in Jaipur street shopping. Kishanpol is best known for textile goods which can be bought at reasonable prices. 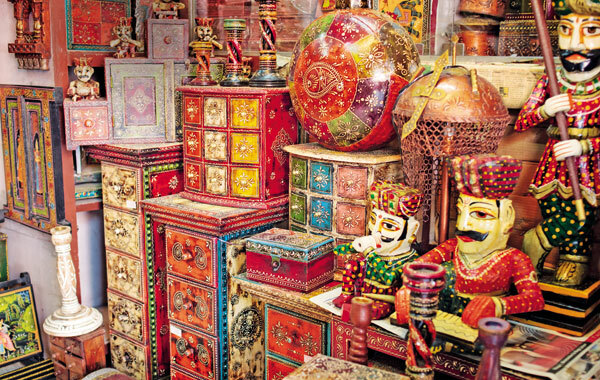 It is also one of the best places to visit in Jaipur for shopping, to get your loved ones some wooden souvenirs; as Kishanpol Bazaar is home to many skilled artists renowned for their unique wooden carvings. Although you can find some beautiful clothes and textiles in Nehru Bazaar, the main attraction of Nehru Bazaar are the traditional joothis, which looks vibrant with multi-colored design. All of them look tempting, but ensure to bargain well before you buy a handful! 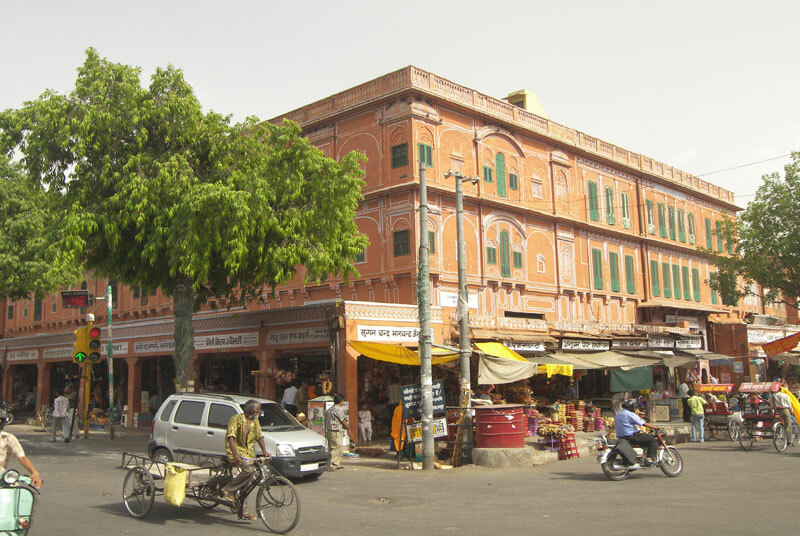 Sireh Deori Bazaar, opposite to the famous Hawa Mahal is a perfect place for window shopping and street shopping in Jaipur, since you get a glimpse of the overall shopping items available here. Leather shoes, puppets, knickknacks and some unique hangings can be picked up from here, which are exclusive make of Jaipur. The best place to visit in Jaipur for shopping, Bapu Bazaar is a one stop destination for all the Jaipuri items as you could almost buy anything for a reasonable price. This bazaar stands out for the moderate prices of items like textiles and Joothis. Here you can enjoy the novelty of street shopping in Jaipur. Plus, the bazaar lies in a pretty location and you could get to witness the ‘pink’ side of the city! Speciality – Best quality Jaipur textile goods are present here. However, be ready to bargain! Pottery in Jaipur is taken too seriously -And you’re sure to fall in love with the pottery works the moment your gaze falls on them! Visit MI — the most vibrant of the shopping places in Jaipur — road to shop for pottery work, which dates back to the days of the Rajput kings who used the pots extensively to beautify their palaces. So head there to add some beautiful collections to your home. Also, look for brass statues and wooden items. These are the beautiful shopping destinations unique to Jaipur, which are what makes Jaipur the cultural shopping capital. So, next time you visit this majestic city, be sure to head out to these places for shopping in Jaipur and go back home with your hands full of shopped items and heart full of happiness! If you have had enough of the traditional stuff, Raja Park is the place to be at. It offers everything ranging from grocery to flowers, from furniture to apparel. Gaurav Towers is the most happening joint in Jaipur. Situated away from the congested market place, the shopping mall at Gaurav Towers – or GT – attracts both shoppers and fun seekers. Spread across a sprawling area of 25,000 sq metres, GT is perfect in terms of ambience, space, variety and hassle free parking. I am sure you would love to fly high in the Sky! Oh yes, you can feel like having wings, You can experience a Hot air balloon ride in Jaipur at Skywaltz Cafe located at Jaipur-Delhi highway. It’s a ride you must experience! You will be picked from your place at around 5.30 am. At the balloon launch site you will be served with cookies and hot drinks. You can watch the balloon being filled up with hot air which is very interesting. The balloon will be took off at sunrise from the lakeside beside the Amber Fort. The ride will glide pass the fort glowing red from the early sun’s rays, the balloon will rise to a height of about 1,000 plus feet and you can watched the tiny houses and ribbon like streets below. Our balloon pilots are very capable and experienced, at times they fly the balloon at very low levels so that we can see people in their homes and villages. The flight at all times is very safe and comfortable. It is something worthwhile trying when you are in Jaipur. The staff there will ensure that you will have a memorable time. Eleplant ride in Jaipur is a unique experience. You must go for a evening ride which will be peaceful and romantic way to spend your time. It will be followed by an hour of cocktails and canapés before a really well prepared dinner. . This is an authentic Indian experience with decent food, attentive service and hygenic. Elephants here are very well treated and not exploited beyond what most would consider to be reasonable given their environment. The fort of Bhangarh is amusingly said to be haunted, as it is surrounded by Jungle. Its a ruined fort situated on some height. There is a large open space / garden which attracts kids but to see the fort closely, you will have to do some steep climbing. The view from top is very good. On entrance, you will see the old used to be shops of the inhabitants along with few temples including Hanuman temple at the entrance. The road to this place is pathetic. People say, they hear different voices in night. I assume, when wind passes by the temples and jungle it create that noises. Bahangarh is a must visit place. Avoid taking small kids. Sam Sand Dunes is a must visit in Rajasthan, India, especially when you visit Jaisalmer. This place is widely famous among tourists from India as well as abroad. It situated around 40 kilometre west of Jaisalmer city through a well connected road. Right from exit to the city, we can witness raw beauty of deserted landscapes everywhere. You can find different categories of hotels/resorts after 15 kms onwards including variety of windmills producing energy. Local travel operators based on Jaisalmer provide wide range of tailored & custom packages to all kind of tourists. Most of the packages include camel ride, jeep ride, cultural programs and tented camps with basic to exclusive facilities to the guests. The pristine desert range & dunes just half km from highway gives you wild experience plus exotic feelings for your eyes. During sunrise & sunset, the desert looks like dreamy & picturesque view soothing your eye from years to come. A must visit to all travellers. As Ranthambore Wildlife Century is famous for Tigers, The best thing is that numbers are up with 50-60 tigers in a pretty small area, so if you get allocated the right zone then you’re in with a chance. You must go for Ranthambore Jeep Safari and explore zones 3&4 which are in the centre and have good sightings, but it is pure luck if you get them and even then there is obviously no guarantee. It is an awesome getaway for the weekend. Situated in Udaipur is the fateh sagar lake named after Maharana Fateh Singh of Udaipur. The lake is surrounded by aravali hills on three sides. It has a small park called as Nehru Park in the middle of the lake and can be accessed by inboard water boats. Don’t forget to take a stroll along the lake in evening. Rajasthan Distance Calculator, If we send Our hotel Car for you at the airport then you have to pay Rs 70 extra for parking. Choose the Origin and the Destination in Rajasthan Distance Calculator and know the exact distance between two destinations. Rajasthan Distance Calculator for Calculate between any two cities, towns or villages in Rajasthan and Rajasthan Distance Chart, Rajasthan Distance Map. From the Railway station: (10 minutes walk) From the pre paid auto rickshaw booth and take an auto rickshaw who will charge Rs 25/- to the Hotel. If walking take the station road towards main bus terminal (sindhi camp) at the Front site of Polo Victory Cinema Hall take a small road then come to 2nd left side. The hotel is just inside this road. From the main Bus terminal: (5 minutes walk) From the auto rickshaw stand take a auto rickshaw who will charge Rs 20/- to the Hotel. If walking come out of the terminal turn right and walk straight towards Hotels near Railway station Jaipur you will See Polo Victory Cinema Hall Come in front Road and take a small road, then come to 2nd left side. The hotel is just inside this road. From the Air Port: (Half hour by car Or Auto) If you come by Taxi ask the driver for Sindi Camp Bus Stand. Car will charge Rs 350/- or by auto rickshaw Rs 150/-. If we send Our hotel Car for you at the airport then you have to pay Rs 70 extra for parking. Golden Hotel, Jaipur always strives to bring the best facilities for travellers with a tight budget. This is yet another attempt in the same direction. We present to you “The J Thai Spa” located about 3 Km from Golden Hotel in Jaipur. We promise superb discounts at this Spa for guests staying at The Golden Hotel, Jaipur. Stay with Golden Hotel & Get Cash-Discount Vouchers for The J Thai Spa on Full Body Services. At J Thai Spa in Jaipur, it is about you. Take your mind, body & spirit on a rejuventaing journey of ancient Indian and south-east Asian therapies and treatments. Our spa offers an oppurtunity to relax, and bring your physical, and spiritual selves back into alignment through divine massage and techniques as unique as you are. J Thai Spa incomparable passion for research into wellness solutions and products, treatments and training give you experiences of a lifetime. HAWA MAHAL – Hawa Mahal built in 1799, by Maharaja Sawai Pratap Singh, is the most recognizable monuments of Jaipur. The 5 stories stunning semi-octagonal monument having 152 windows with over hanging latticed balconies is a fine piece of Rajput architecture. Originally designed for the royal ladies to watch and enjoy the processions and other activities, on the street below. JANTAR MANTAR – Jantar Mantar built in 18th century by Maharaja Sawai Jai Singh II, the huge masonary instruments were used to study the movement of constellations and stars in the sky. Enormous sun-dial still provide accurate time, which are subject to daily corrections. CITY PALACE – City Palace situated in the heart of the old city. It occupies about one seventh of the old city area. The palace is a blend of Rajput and Mughal architecture, it houses a seven storeyed Chandra Mahal in the centre, which affords a fine view of the gardens and the city. MUSEUM – Museum situated in the Ram Niwas Garden. This graceful building was founded in 1876 by Prince Albert (also known as Albert Hall). It has a rare collection of archaeological and handicraft pieces. JAL MAHAL – This small palace is set in the middle of Man Sagar Lake. BIRLA MANDIR – It is situated just below the Moti Dungri, Known for the intricate marble carvings in white marble, it’s also called by Laxmi Narayan Temple. KANK VRINDAVAN – This newly restored temple and garden near Jal Mahal, has beautiful gardens and is popular picnic place. SISODIA RANI GARDEN – It’s on the way of Agra road, the magnificent palace garden was built by Maharaja Sawai Jai Singh II in 1710 for his queen. JAIGARH FORT – It’s standing on a hilltop, overlooking the palaces and city of Amer. The world’s biggest cannon of wheels- the Jai Ban is positioned here, built during reign of Maharaja Sawai Jaisingh. It has a twenty feet long barrel and pumped in the cannon for a single shot. NAHARGARH FORT – It’s cresting a hill about 600ft. above the city, the fort was built in 1734. The walls of the fort run along the ridge and within are architectural beauties like Hawa Mahal & Madhvendra Bhawan. AMER FORT – The old capital of the Kachhwahas stands atop a range of craggy hills. The fort is remarkable as much for the majestic grandeur of its surroundings as for its sturdy battlements and beautiful palaces. It is a fine blend of Hindu and Muslim architecture. The solemn dignity of it red sandstone and white marble pavilions, when reflected in the lake at the foot hill, is a sight to behold. The original palace was built by Raja Man Singh, the additional extensions were built by Maharaja Mirja Jai Singh & Sawai Jai Singh II the last Maharaja of Amer, who built a new city called Jaipur, where he shifted his capital in 1727. The palace complex is lavishly ornamented and displays the riches of Amer. Sheesh Mahal chamber of Mirrors. Diwan-e-Am or the Hall of Public Audience is a beautifully proportioned hall open on three sides and stands on two rows of ornamented pillars. The old city of Amer was the seat of power and bustling with life and prosperity. Other worth seeing sites are Jagat Shiromani Temple. Some of Jaipur’s best shopping experiences are to be found in city’s old bazaars. These are located in the walled city, around the two main blocks called the Badi and Chhoti Chaupar. Visit them for a first-hand experience of the city’s long-standing tradition of craftsmanship, and to get schooled in the art of bargaining while you’re at it. Also known as the jeweler’s market, Johari Bazaar consists of rows upon rows of jewelery shops. Located opposite the city’s famous Hawa Mahal, the Sireh Deori is the main bazaar which leads from the western gate of the city walls past the city palace to the eastern city. 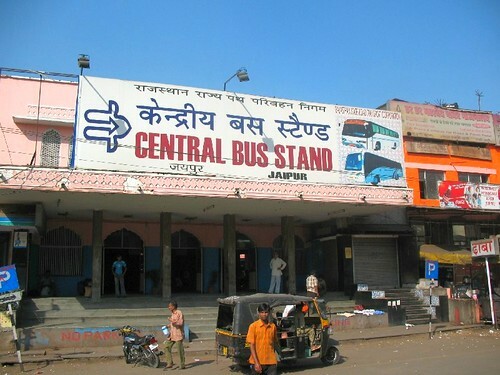 Places to Visit in Jaipur, Jaipur the capital of Rajasthan knows as pinkcity. This Beautiful city along with Agra and Delhi known as the Golden Triangle of Indian tourist circuit.